Need a little help getting into the holiday spirit? 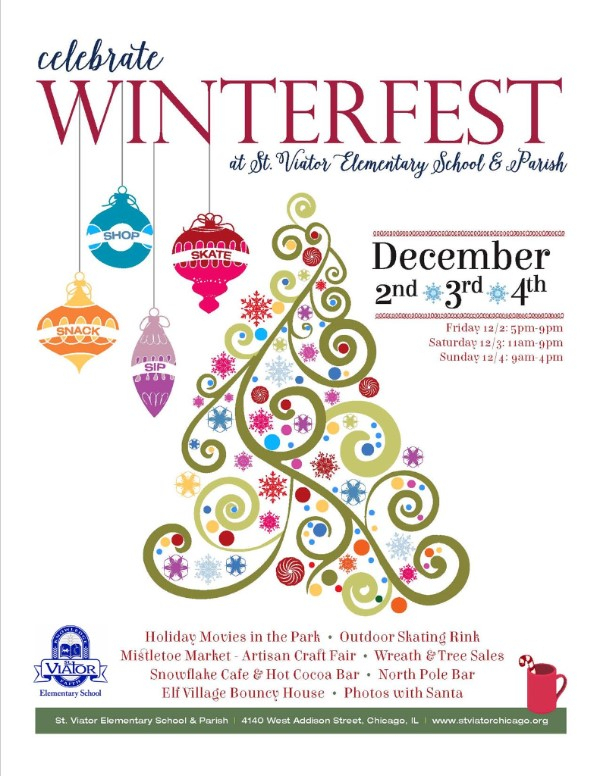 The weather here in Chicago is not cooperating, so thankfully there’s the St. Viator WINTERFEST this weekend. 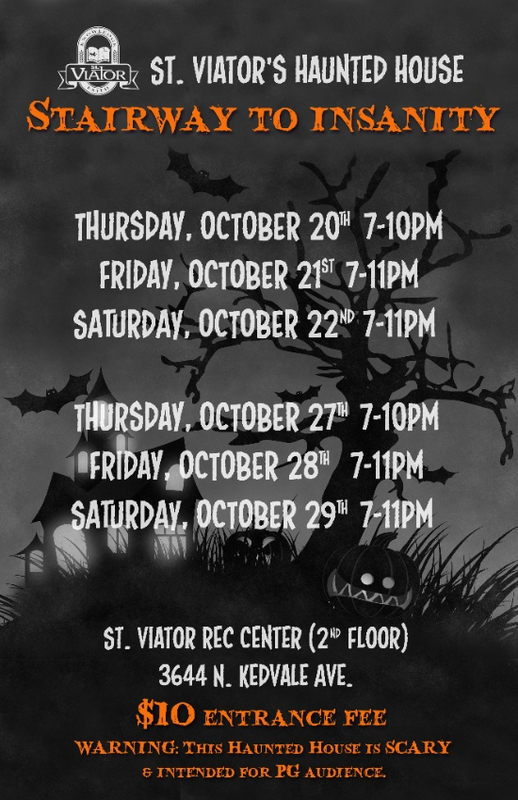 Check out this flier for a complete list of all the happenings. I know Wife and I are in the market for a real wreath, and we’ll see if Sweetie and Cricket want to decorate some cookies. I bet we all get after some hot chocolate (regardless of the weather). If you haven’t filled your weekend with plans consider coming up to the northside and enjoying some holiday spirit. ‘Tis the season! Well, the parties are over, the candy bowl is empty, the plastic pumpkins are full of treats and the girls are passed out. 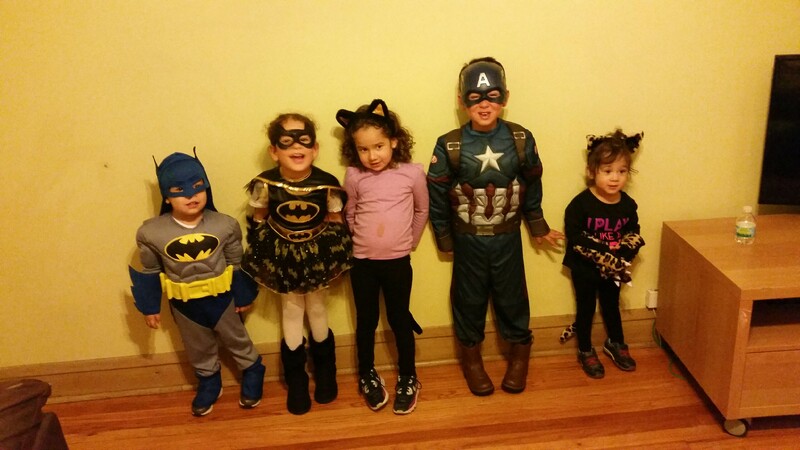 I call this a successful Halloween for our crew. Despite being out of our neighborhood, Wife and I found a bunch of stuff to do this Halloween. So we already started laying the plans out for next year – not too shabby. The girls seemed to enjoy it all: parties with friends (see above) and bonfires and pumpkins and trick-or-treating – oh boy! So I hope you and yours also had a safe and fun Halloween, time for me to sort and hide the candy. Hope your prep for Halloween is going well! The time has come to send Sweetie back to school. 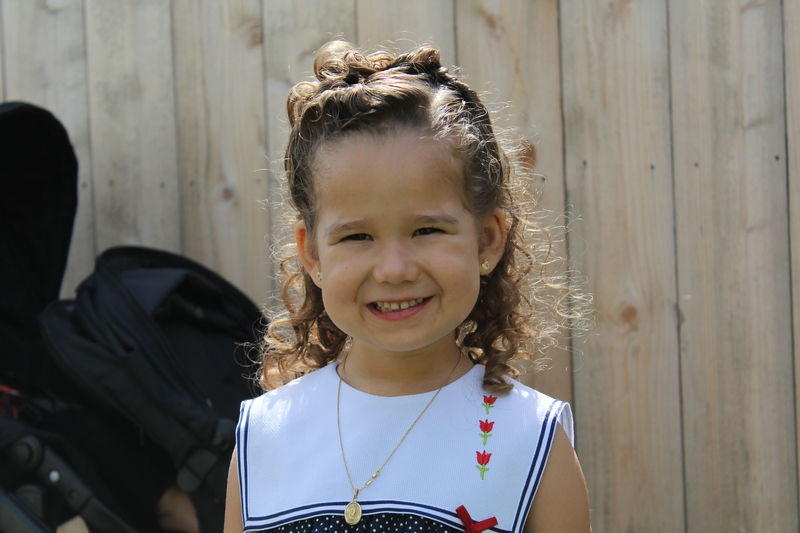 This year she is in PreK-4 – whee! Here’s us leaving home. Sweetie was showing mixed emotions about going back. She was happy at an earlier “Welcome Tea”, checking out her new classroom and such. But she was definitely moving slowly as we got closer to the door. And she wanted nothing to do with our cute sign. Nope, wouldn’t hold it. Too cool for sign, just right for school. Wow, sorry that last one is so fuzzy (firmly planted me with a camera vs. me sitting in the front seat rushing the shot with my phone at a stoplight). You get the picture though, she was worn out. I guess it will be an adjustment for her to be an “All-Day Friend”. We’re glad school is back in session, it was a fast summer and a bit hectic. With Sweetie back in class she gets some good challenges and gets to have some fun with her friends. Good stuff. Hope your Back-to-School is going smoothly. It’s really like a month-long event with all the different starts. Regardless when they go back, I hope your little ones have a great start to their year. And hopefully it is a welcome break for all you parents as well. Alright, we have some lunch to build, outfits to choose, and a backpack to sort – now where’s my Kangol? There are limousines parked at the Olive Garden, Facebook is exploding with photos of teens in ill-fitting evening wear and reunions abound – we are in the homecoming season. We celebrated by attending my 20 year high school reunion. It turned out to be a fun night spent in the northwest suburbs (down the street from my high school) with many pleasant re-connections and funny memories. We did not take the girls with us, for obvious reasons. But I did try to remember a few things from the night to share with them as they face challenges approach older school years. I figure I have to record these thoughts now – my memory might not be so great by the time the girls can appreciate this wisdom. Things change, people change. It was weird to look around a room full of classmates and pause with so many people. Some of the people who were big in high school are not so big anymore. And some people who were small are not so small anymore. Some people who were “too cool” twenty years ago are approachable and friendly. And some who were friendly then are now a bit too cool. Like everything else in life, people change. The more things change, the more they stay the same. About halfway through the event it struck me. The novelty of the night was wearing off, the music was getting too loud to talk, and the alcohol was setting in. And people starting drifting into the groups that they knew twenty years prior. People went with what was comfortable, even if it was a bit older. Everything shakes out, even if it takes twenty years. Again, the evening was full of pleasant re-connections. Gone were so many of the social constructs of our youth. The social strata was also largely absent. Nobody got loud and nobody re-hashed twenty-year-old drama. Interactions felt more genuine – we were meeting one another right where we were, and that was okay. I know this stuff is not really profound. In fact, I am sure many people would just say it is just a sign of “growing up”. But I do hope to share these thoughts with the girls when they are in high school. My high school years were not traumatic, but there are things that could’ve been better. I expect their experience to be similar, so I want to have some good stuff to offer them. So for all of you out there who were at the event, it was great seeing you. I am glad our detours crossed. Especially MN – congrats again on your success, so good to see you, girl. To all those from the “rival” high school, glad you crossed Camp McDonald. So now I guess we start looking forward to the thirty year – Go wildcats! Random Thought for Thursday: It’s Picture Day! And that introduces Sweetie’s big excitement: today was her first picture day! 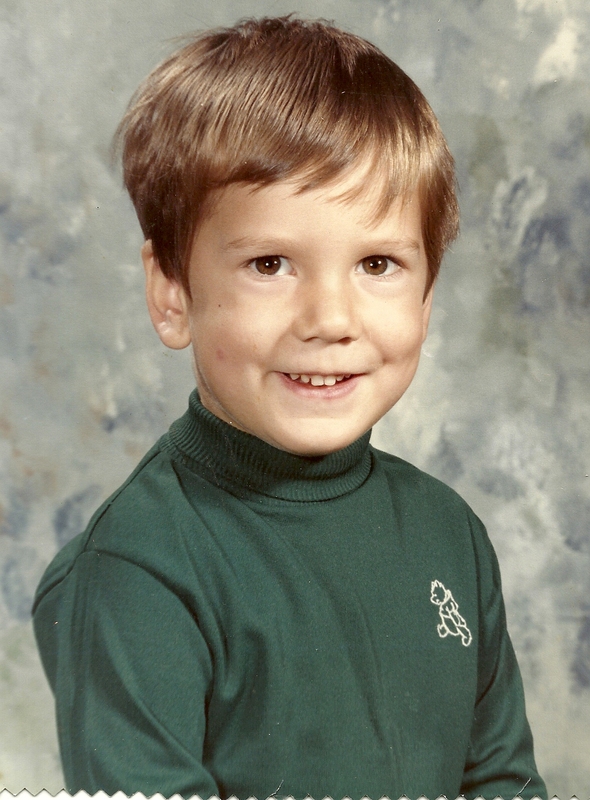 I know, I know, “What is so random about picture day?” I mean, it only happens to every school kid in America. Every year. Whether they are ready for it or not. No, it has nothing to do with picture day, but rather with my conversation with Sweetie this morning, before picture day. Wife had done Sweetie’s hair up all nice, and put her in a cute dress (see below). Mind you, this is 7 a.m., no coffee, no shower, no shave, and said shirt and pants were from yesterday (my morning routine happens after Wife and Sweetie leave). Children are blinded by their love for their parents. Random Thought For Thursday: TBT from Me?!? I have been avoiding the “TBT” trend for a while now. Mainly because this blog is supposed to center around the girls and throw backs go to a time before them. But I am also not a follower of the trends and habits of the “socials”. I don’t know selfie etiquette, I seldom photograph my meals and I have never broadcast my location in real-time. I have yet to send a tweet and have never watched a vine. So throwing back has not been a high priority for me. The TBT idea works with my “Random Thought” theme though, as it’s just as random as the things my 3 year-old says. And many times also just as cute. 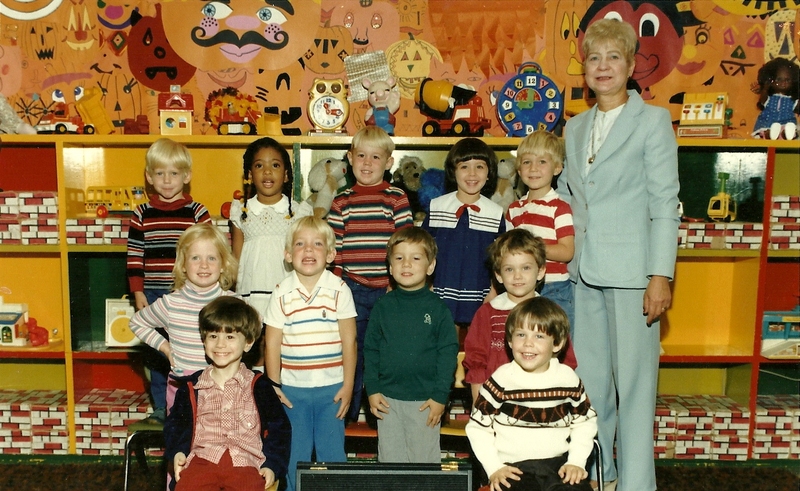 Yep, this is a picture from my PreK-3 class, circa 1980. Can you find the 3 year-old Flagman? If not, don’t fret, Wife couldn’t either. Looking back to this photo, I realized I didn’t see many of these folks after Kindergarten. Oh well, maybe Sweetie’s ride will be different. Oh, I just want to take a second to thank everyone for the kind comments to Tuesday’s post. So far this school thing is going off without a hitch. And without a tear! But it is still nice to read supportive, caring comments for my girl. I hope your new school adventures are going just as well.